The crow stands on the riverbank, her back to the gold cups that symbolize material wealth and possessions. She is ready to fly off and leave it all behind. The moon represents her shadow-self and her true nature, one she tries to suppress, but can not deny. 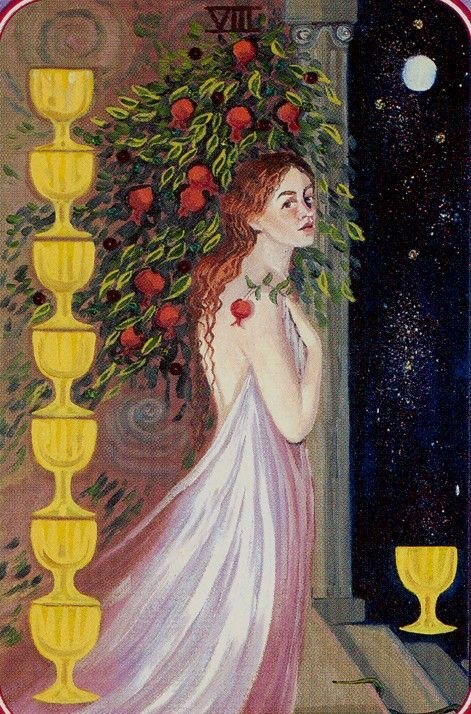 The Eight of Cups asks that you look inward and discover what it is you want from your life, what is important to you. This card suggests that although it will take considerable strength to let go and walk away, it may be necessary to achieve true happiness. This entry was posted in Artist, Deck Review, Featured Card of the Day, General Tarot, Readings and tagged 8 of Cups, Artist, Crow, Guidance, Path, Reading, Tarot. Limitations, stagnation. Changing a path, leaving something behind. A man who is depicted from behind stays on the beach, leaning on his staff. The moon illuminates this scene with a dim light through the clouds. Eight big cups stand on the ground, setting on each other, behind the man. This view represents a situation in which the man turned away from his previous life. The cups symbolize belongings that he is leaving behind. Perhaps, it is the beginning of a new way or spiritual journey. This entry was posted in Artist, Deck Review, Featured Card of the Day, General Tarot, Readings and tagged 8 of Cups, Artist, Guidance, New Babylonian, Path, Reading, Roxana Paul, Tarot. A new pathway of discovery, a need to move onward, a turning point, finding inner truth. 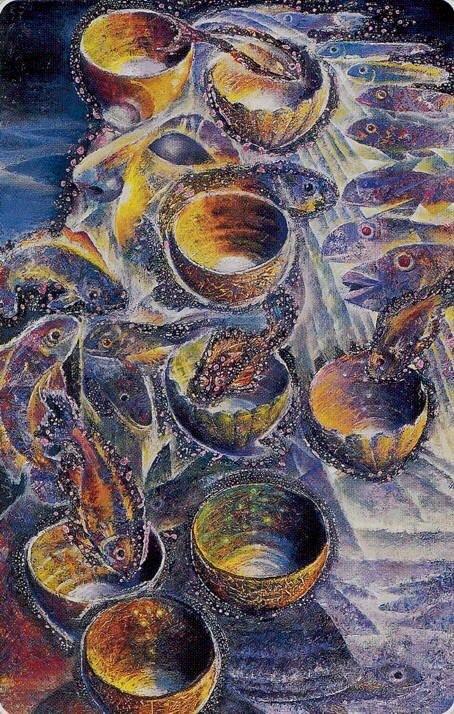 This entry was posted in Artist, Deck Review, Featured Card of the Day, General Tarot, Readings and tagged 8 of Cups, Artist, Guidance, Path, Paulina Cassidy, Reading, Tarot. The promise of new opportunities beckons on the horizon, but what about your current life? It has served its purpose up until now, some good, some bad, but so much more awaits you just on the other side of the impending Full Moon in Pisces which we be here in two more days. The 8 of Cups is often associated with disappointment, abandonment, and moving on, likely in search of a better life. The timing is right, especially as Mars turn direct in three days, to set out on a new adventure of discovery. If there has been nonsense, whether it was Eclipse and retrograde related or not, being able to turn your back on this part opens you up to new possibilities. There is no remorse with this card; you are ready and willing to venture forth and see what the Universe has in store for you next. The time has come to leave the excess baggage behind and go in search of what you truly need. With Neptune newly retrograde, it is highly possible for dreams to be off the charts. It can be very easy to want to escape into that dream world, having the kind of vibe that says…”I don’t want to be here; I just want to be there”. In due time you will be arriving there, if the Universe so intends. The 8 of Cups has a feel of moving on associated with it, and your current desire to be somewhere else may seem overwhelming at the moment. Now is not the time, unfortunately, but the actions you take now in your waking hours can aid you in making the choices to find your way to that new destination. You will be much closer by the end of August, so, for the moment, pay close attention to what your dreams are telling you, for they contain some shreds of truth which will help guide you to the next part of your journey. This entry was posted in Card of the Day, General Tarot, Patreon, Readings, YouTube Videos and tagged 8 of Cups, Card of the Day, Guidance, Path, Reading, Tarot. It is time to leave something be for a while, perhaps not permanently, but at least for the interim, because it appears you have better things which you need to be doing. This is a card of moving on and abandoning something, likely due to disappointment because it just wasn’t turning out the way you planned. At one time it appears to have been a good thing, but lately there may simply be too much nonsense attached and this does not suit you. Right now, you have only a few short weeks to really make things happen before the big slowdown of 2018 begins, so turning your back on situations, people and projects, which are not currently worth your effort, can free you up to explore new possibilities. It could be at a later date that you choose to revisit this topic, but, for now, it is in your best interest to move on and explore some new territory.